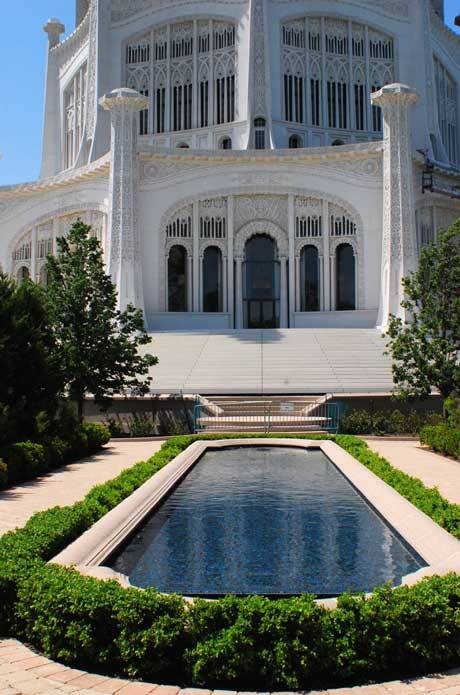 The Baha’i House of Worship, just 30 minutes north of Chicago, is as close to godly as you can get. With its majestic architecture, serene gardens, and elaborate interior, the Baha’i temple is one of Illinois’s most beautiful landmarks. The temple is the only Baha’i temple in North America and only one of seven total in the world. While each temple has its own unique design, all Baha’i temples have nine sides, are circular, and are surrounded by gardens and walkways. The nine sides of the temples represent the unity of world religions, a core belief of the Baha’i faith. The North American Baha’i temple in particular is an architectural phenomenon. It was built on a bluff overlooking Lake Michigan and took over 30 years to build. When you enter the dome temple, two things will inevitably happen. First, you’ll be overcome with an innate feeling to be still. Then, you’ll notice the many people sitting with their heads tilted back, seemingly looking up towards the sky. “Why are they sitting like that?” you’ll ask, an uneasy feeling in your stomach. That’s when you look up, gasp, and say, “Oh my god.” Yes, the design of the interior dome is that beautiful. Rising at more than 130 feet, the dome is covered in intricate, lace-like embellishment. You’ll keep asking yourself how the beautiful ornamentation was made. Through an incredibly complicated process, sculptors used the architect’s intricate drawings and meticulously recreated them on panels. The temple also has elaborate ornamentation decorating the exterior. Each of the nine towers feature symbols that represent different world religions, reaffirming the Baha’i’s belief in global unity. Another thing you’ll probably wonder is, “How can the building be so white?” Quartz was mixed with sand and cement to create the whitest concrete possible for the temple’s exterior. An astonishing 743 tons of quartz were used to build the exterior dome alone. Surrounding the pale temple are lush gardens and gorgeous mosaic fountains. Anyone, no matter what religion, is welcome to enter the temple to pray and meditate. The Baha’i faith is based on global unity: the oneness of God, the oneness of humanity, and the oneness of religion. With over five million followers, Baha’is believe that all religions and races are one, and all prejudices should be abandoned. They also believe in universal education and the elimination of the extremes of wealth and poverty (sounds pretty good to me!). Bahai’s also believe that throughout history, God has sent divine messengers, such as Buddha and Jesus, to reveal God’s will. They follow the teachings of Baha’u’llah, who they consider to be the most recent divine messenger. Baha’is have suffered persecution for their religious beliefs, particularly in the country where it was founded, Iran. The largest Baha’i groups in the United States can be found in Illinois, California, Texas, Georgia, and South Carolina. It is no wonder that it took architect Louis Bourgeois over 8 years to create just the architectural drawings. The breath-taking temple is even listed on the National Register of Historic Places. If you can’t wait another second to see what I’m talking about, watch a 15-minute video about the temple or take a virtual tour. Of course, nothing compares to seeing it in person. Visitors Center open daily from 10 to 5. House of Worship open daily 6 a.m. to 10 p.m.